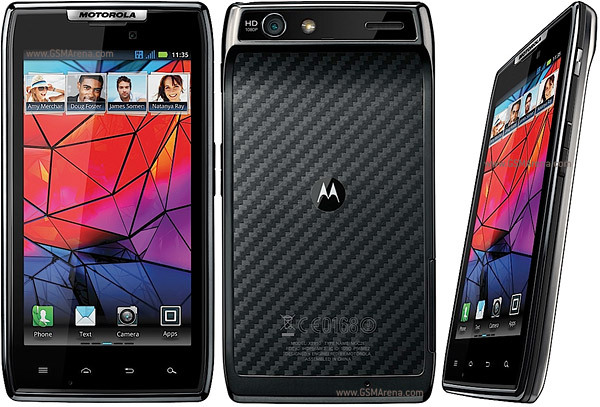 The Motorola Razr XT910 is a beautiful 4.3-inch sAMOLED capacitive touchscreen phone. It is constructed of the strong Corning Gorilla Glass, and slightest weight of 127 grams. Its diamond shaped back and the Kevlar coating helps the phone to have a better grip within hands. It is made in manner that it has a micro SIM and the slot hidden under a plastic cover to the left of the phone. The measures of Motorola Razr XT910 are 130.7mm x 68.9mm x 7.1mm. Its total size is 4.3-inch size and it is very common for smart phones now-a-days. Its on/off button is located at its top. For the process of the phone is it has 1.2GHz dual-core processor and 1GB of RAM. There are also some updates in its home screen widgets that can be modified according to the usage and requirement. The phone instead of standard onscreen keyboard has new Swype keyboard installed on it. MotoPrint is another big feature of the phone. It allows straight print straight from the phone with support for an easy printing of information like contacts, documents, emails or calendar entries. In multimedia its audio quality of the Razr is quite rich and enjoyable. The Razr XT910 comes with a 8-megapixel camera at the back and a 1.3-megapixel camera at the front. The phone packs in 1780 mAh of battery that is absorbed within 4-5 hours of heavy use on 3G. On normal usage batter ends in 8-9 hours. It is good set for style conscious people and comes into the range of Rs 27,000.